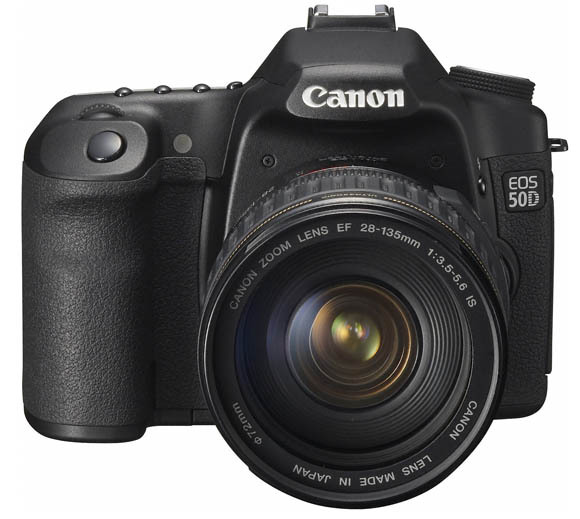 Canon has launched the Canon EOS 50D , an updated versions of the EOS 40D. The EOS 50D features a 15.1-megapixel CMOS APS-C size image sensor that uses newly designed gapless microlenses over each pixel to reduce noise and expand sensitivity up to ISO 12800. 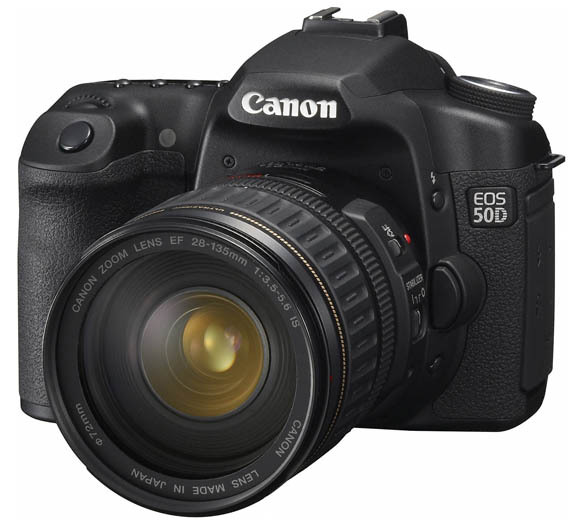 The EOS 50D also features a faster DIGIC 4 processor allowing 6.3 fps continuous shooting capability, 3.0 inch VGA Clear View LCD monitor (920,000 dots) with enhanced Live View that includes face detection and 3 AF modes. A HDMI connection for high Quality Image viewing is included. The EOS 50D also has a new Creative Auto mode and a quick control screen that helps novice users narrow the gap between fully automatic and manual control. Frequently changed settings like flash, exposure compensation, image quality and more are all accessible through one easy screen interface designed for intuitive, quick action. Enhanced Live View shooting includes Face Detection Live mode. This entry was posted in Canon, Digital Cameras and tagged Canon DSLR, Canon EOS, Canon EOS 50D on August 26, 2008 by jonathanb. The Digital Picture has reviewed the Canon EOS 40D Digital SLR a 10.1 megapixel (CMOS sensor) DSLR with 6.5 frames per second shooting, a new Autofocus system with 9 cross type sensors, 3.0 inch LCD with Live View, DIGIC III image processor, EOS integrated cleaning system, Spot Metering, and a larger, brighter view finder and quieter mechanism than it’s predecessor. This entry was posted in Canon, Digital Cameras and tagged Canon, Canon EOS, Canon EOS 40D on August 10, 2008 by jonathanb. CNET Asia has a preview of the Canon EOS 1000D / Rebel XS a 10.1 megapixel entry level digital SLR, featuring 7-point wide area AF system. 2.5 inch LCD display, and up to 3fps continuous JPEG shooting. The EOS 1000D also includes the DIGIC III image processor, Live View mode, and EOS Integrated Cleaning System. This entry was posted in Canon, Digital Cameras and tagged Canon, Canon EOS, Canon EOS 1000D, Canon Rebel XS on July 25, 2008 by jonathanb. PhotographyBLOG has reviewed the Canon EOS 40D a 10.1 megapixel (CMOS sensor) DSLR with 6.5 frames per second shooting, a new Autofocus system with 9 cross type sensors, 3.0 inch LCD with Live View, DIGIC III image processor, EOS integrated cleaning system, Spot Metering, and a larger, brighter view finder and quieter mechanism than it’s predecessor. They write – "The high points of the Canon EOS 40D are the tough, durable body, the control layout and that amazing 6.5fps shooting mode. Yes, it does soundly like a badly-muffled machine-gun, but it lets you grab action sequences that lesser cameras would miss. The speed of the AF system keeps moving subjects sharp, too. But perhaps the most striking thing about the Canon EOS 40D is its value. It’s true that it costs more than other 10-megapixel cameras, but it’s also much more professionally-orientated. Its nearest rival in the semi-pro market would be the newly-announced Nikon D300, but the list price is £1300 for the body only, and for that money you could get an EOS 40D and Canon’s 17-85mm image-stabilised lens and have change to spare. The Canon EOS 40D’s strength doesn’t lie in any great technological breakthrough but in its professional appeal and its sheer value for money." This entry was posted in Canon, Digital Cameras and tagged Canon, Canon EOS, Canon EOS 40D on July 25, 2008 by jonathanb. Pocket Lint has reviewed the Canon EOS 40D a 10.1 megapixel (CMOS sensor) DSLR with 6.5 frames per second shooting, a new Autofocus system with 9 cross type sensors, 3.0 inch LCD with Live View, DIGIC III image processor, EOS integrated cleaning system, Spot Metering, and a larger, brighter view finder and quieter mechanism than it’s predecessor. They write: "Overall, the Canon EOS 40D is a more than able update of the 30D and since the introduction of the first Canon prosumer DSLR, the 3.1-megapixel EOS D30 back in 2000, it is light years ahead on that base line. In a nutshell, this is a cracking camera and one marred only by the odd metering performance, otherwise it is quite simply excellent and worth a close inspection for anyone either trading up or for those pros’ that need a back up body that is not a compromise to far." This entry was posted in Canon, Digital Cameras and tagged Canon, Canon EOS, Canon EOS 40D on July 1, 2008 by jonathanb. CNET has reviewed the Canon EOS 40D a 10.1 megapixel (CMOS sensor) DSLR with 6.5 frames per second shooting, a new Autofocus system with 9 cross type sensors, 3.0 inch LCD with Live View, DIGIC III image processor, EOS integrated cleaning system, Spot Metering, and a larger, brighter view finder and quieter mechanism than it’s predecessor. 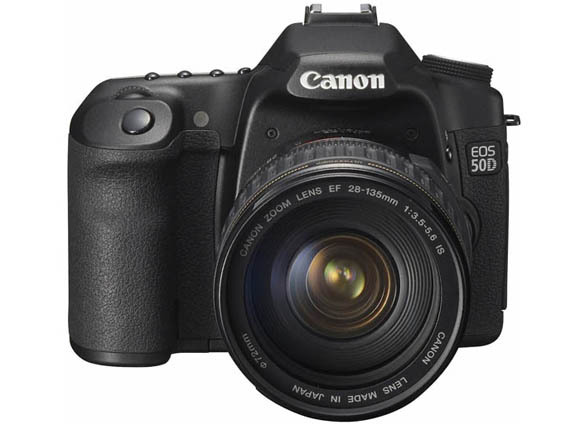 They write – "For Canon devotees, the EOS 40D is a great camera and remains an excellent choice compared to most of the dSLRs in and around its price class–with one exception. Despite its many attractions, the Canon EOS 40D doesn’t clearly outshine the Nikon D80, which costs a lot less. Though the 40D has the obvious advantage for action shooting–almost double the burst rate and a higher top shutter speed–the D80 generally feels a bit faster and more responsive for single-shot photography. I think the 40D ultimately does deliver better photo quality, but some people might find the differences more subtle than the price differential warrants. And, of course, the more expensive Nikon D300 remains a wild card until we’ve tested it. So for the moment, the 40D gets a hearty, if not wholly unqualified, endorsement." This entry was posted in Canon, Digital Cameras and tagged Canon, Canon EOS, Canon EOS 40D on June 26, 2008 by jonathanb. Camera Labs has a preview of the Canon EOS 1000D / Rebel XS a 10.1 megapixel entry level digital SLR, featuring 7-point wide area AF system. 2.5 inch LCD display, and up to 3fps continuous JPEG shooting. The EOS 1000D also includes the DIGIC III image processor, Live View mode, and EOS Integrated Cleaning System. This entry was posted in Canon, Digital Cameras and tagged Canon, Canon EOS, Canon EOS 1000D, Canon Rebel XS on June 23, 2008 by jonathanb. Bob Atkins has reviewed the Canon EOS 40D a 10.1 megapixel (CMOS sensor) DSLR with 6.5 frames per second shooting, a new Autofocus system with 9 cross type sensors, 3.0 inch LCD with Live View, DIGIC III image processor, EOS integrated cleaning system, Spot Metering, and a larger, brighter view finder and quieter mechanism than it’s predecessor. This entry was posted in Canon, Digital Cameras and tagged Canon, Canon EOS, Canon EOS 40D on June 20, 2008 by jonathanb.